Ovechkin's initial shot smacked off the far post. 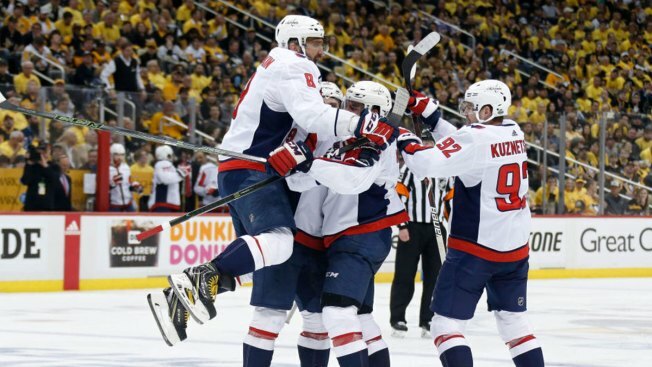 "It's a good thing I didn't raise my arms up (after the first shot), you know to (celebrate) the play," Ovechkin said after scoring his eighth goal of the playoffs. "Got lucky." Matt Niskanen, John Carlson and Chandler Stephenson also scored for Washington, which improved to 4-0 on the road in the postseason. Braden Holtby finished with 19 saves. Backstrom had three assists, including the helper on Ovechkin's winner. "It's huge, huge goal," Ovechkin said. "Obviously for our team, you know we want to win tonight and we did. It doesn't matter what, it doesn't matter who scored. We sacrifice. We play hard. And we have to do the same moving forward." Pittsburgh also lost forward Zach Aston-Reese to a broken jaw and a concussion following a violent collision with Washington's Tom Wilson at the game's midway point. Pittsburgh defenseman Brian Dumoulin went into the league's concussion protocol after Wilson blindsided him in Game 2 while Dumoulin was bracing for a collision with Ovechkin. The NHL's Department of Player safety didn't ask Wilson to explain himself during a hearing and Dumoulin was back in the lineup to start Game 3. Asked afterward about the hit, Pittsburgh coach Mike Sullivan replied, "at some point we hope the league might do something." "They all got together and they said, 'You know what, we've got a good, clean check here,'" NHL on-site supervisor Paul Devorski said through a pool reporter. Crosby put the Penguins back in front with 3:33 left in the second when he took a pretty pass from Guentzel -- who occupied three Capitals before sliding the puck to his teammate -- and buried it into an open net. Ovechkin and Backstrom's two-on-one gave the Capitals the series lead over Washington for the first time since they won Game 1 of the 2016 Eastern Conference semifinal. The champions have proven to be an impossible out during their current reign. Three tight games in, Washington is well aware there's little margin for error. "It's a funny game," Niskanen said. "Boy, sometimes the puck takes a different bounce and the score can be completely different." NOTES: Penguins C Evgeni Malkin played 19:07 and assisted on Hornqvist's goal in his return after missing three games with a lower-body injury. ... The Penguins hosted Humboldt Broncos junior hockey player Brayden Camrud , a survivor of the bus crash that killed 16 people -- many of them teammates -- last month. ... Pittsburgh F Carl Hagelin skated with his teammates for a second straight day, but remained out of the lineup. Hagelin is dealing with an upper-body injury and has worn a full face shield while on the ice. ... Both teams went 1 for 4 on the power play. ... Guentzel has recorded a point in seven straight playoff games.